When you think of the state of Illinois in the Midwestern part of the US you imagine corn fields, flat landscapes that go on for miles and of course the city of Chicago. 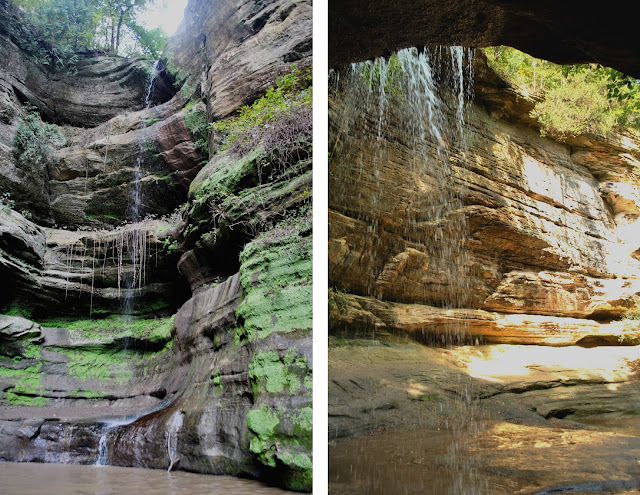 What you didn’t think you would find just two hours outside of Chicago is a state park with steep inclines, sandstone canyons and tall trees – Starved Rock State Park. Last weekend a group of my friends and I spent the day hiking and exploring the many canyons in Starved Rock. Hiking through the park you would think you are a world away from the flat land of Illinois. Our hike began with incredible views from Lovers Leap lookout towards the Illinois River and the various canyons along the riverbank. These canyons were carved out by glacial meltwater coming from glaciers that have receded with time. After seeing the main viewing points we made the ascent to the paths that would lead us to each canyon. Even though it was already autumn the day was humid and warm, among the trees there was no breeze and it felt like a hot summer day. I can’t complain because I know the cold temperatures are quickly approaching so I enjoyed the warm weather. Wildcat Canyon was the first canyon we hiked to that had a large waterfall. The cool water was refreshing after hiking through the humid woods so we stayed for a while, taking in the sight. We continued our hike to the Basswood Canyon and relaxed again in the shade before we hiked the final stretch to LaSalle Canyon. Each canyon we hiked to was unique in it’s own way but the most beautiful in my opinion was LaSalle Canyon (see photos). The hike back was not as treacherous as we thought it would be and once out of the park we enjoyed a picnic of peanut butter and jelly sandwiches. I thought the paths in the state park would be an easy stroll but to my pleasant surprise we spent the day climbing up steeps stairs, crossing over a stream where the bridge was under construction, and enjoying the company of friends. The park had more to offer than I thought and I am happy we planned a trip to the park. Illinois has so many sights and places to offer outside of the Chicago and I hope to get a chance to see more of the state. Amazing photos, looks so beautiful! What a beautiful scenery to hike through! This looks like such a beautiful and amazing place to hike! I can completely imagine how quiet, calm and tranquil it must have been there - besides the waterfalls, that is :) Eek! You're brave for holding that (albeit fluffy) caterpillar!! Starved rock state park looks absolutely beautiful - love all of your gorgeous photos! It sound like you had a great day of hiking in the most stunning surroundings! Beautiful photos! This makes me even more excited for a day of hiking later this month. Loving these photos so much and yes you are entirely right I would never have expected a place like this to exist just outside of Chicago! STunning! 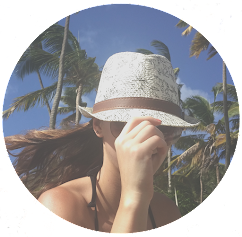 Amazing post and photos my dear! This place looks amazing for nature lovers and I would love to visit it one day! Your posts always make me want to pack a suitcase and take the first plane to anywhere! Wow, this place looks amazing! I've never been to the western US, but I'll be making some plans to go there soon and I'm so excited! This place looks like a dream! Such pretty pics! It was beautiful walking along the trails =o) Thank you! I don't know if I find the fluffy caterpillar cute or terrifying! The waterfall at Wildcat Canyon looks absolutely spectacular though. Some people love the beach but personally I'd pick waterfalls and forestry over the beach any day. This look amazing. I would love to hike a location like this. Aww this place is breathtaking! I love it.